Current Claims Management is a proactive approach to immediate control over and containment of Workers’ Compensation claims costs. The key to effective claims management is to be involved in a claim from the onset, ideally from the date of accident, or as soon as possible. According to current legislation, any dispute involving decisions made by the Workers’ Compensation Board or Appeal bodies must be appealed within one year of the date the decision was made. Therefore, it is imperative to identify potential issues and address all decisions made on a claim within the required timeframe. Early diagnosis, treatment and action are paramount to controlling costs. Effective claims management reflects in accurate assessment rates and, ultimately, lower costs charged to an employer! BCL’s network of associates guarantees professional management of injury and rehabilitation strategies to minimize costs. Through our affiliations, we establish early referrals to physicians, therapists, clinics and other treatment providers, which can facilitate a faster recovery and return to work or identify the need for retraining or vocational rehabilitation. This program has proven itself invaluable to our clients and to injured workers, by accessing treatment options promptly and initiating alternate employment avenues if necessary. Internal claims management can be very time consuming and complex. Understanding WCB legislation, policies and procedures, how they are applied to a claim, what the resulting impact is on a claim, how claim decisions are made and how a claim is processed from beginning to end are key factors in keeping claim costs under control. Using our expertise and experience will take a fraction of the time your organization might use to address the same issues. 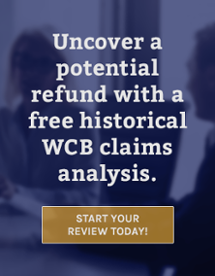 Our staff includes a number of former WCB employees who understand the claims process from the inside out. Combine that with our vast experience in dealing with claims and the WCB for more than 25 years, and it allows us to quickly access pertinent information and historical data that can be directly applied to your specific situation. Having BCL manage your claims allows you to focus on other important aspects of your company and what it does – in other words, us doing our business makes it easier for you to do yours!